If there’s one thing that markets are built for, it’s speculation. Whether or not NAFTA negotiations turn in Canada’s favour or against, the reality is that nobody on either side of the negotiating table is standing still and neither are their respective markets. As the gatekeepers to being able to invest in all of the speculative fervor, online brokerages on either side of the border are showing that they too need to keep moving, and fast, to keep up with the pace of change. Oftentimes it’s a bigger development that makes the cut for the weekly roundup, however this week there is something interesting afoot, specifically lots of little things. The big story this week seems to be that there are lots of little stories – incremental movements – that appear to indicate online brokerages are positioning for a very busy and eventful final stretch to 2018. There’s quite a bit to unpack, so let’s dive in. One of the biggest stories we’ve been tracking in 2018 is the merger between rivals Qtrade Investor and Credential Direct. While there have been a few signals across the year that this change was coming, there has been a firm deadline telegraphed as to when that official cutover date will be. 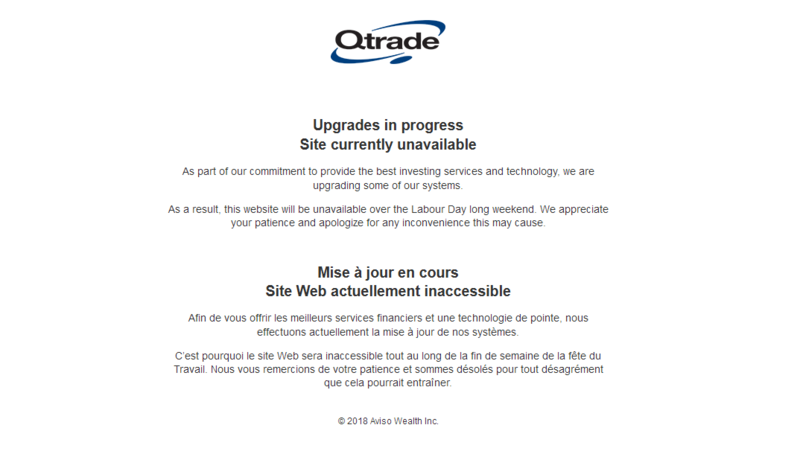 Specifically, a bulletin posted on the Canadian Securities Exchange website on August 29th indicates that Qtrade Securities Inc. will cease its status as a dealer effective September 7th and a new entity, Credential Qtrade Securities Inc. will commence under the broker code, wait for it, 088. 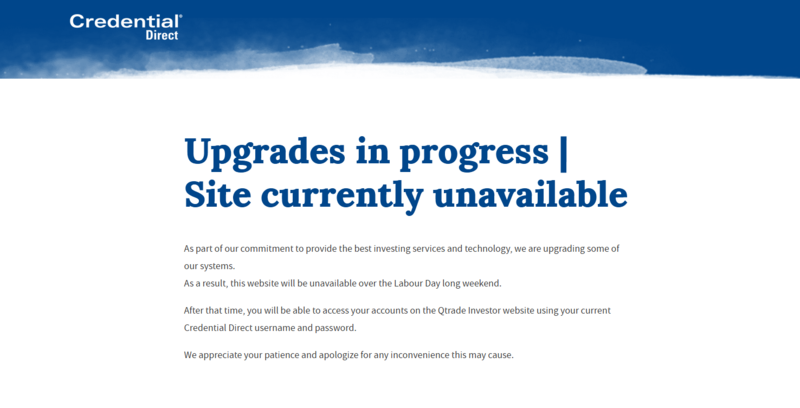 Of course, another interesting sign that things are publicly moving forward is that both the Qtrade Investor website and the Credential Direct website displayed messages that their sites are unavailable over the Labour Day long weekend. So, while lots of folks might be out enjoying the festivities of a long weekend, there’s no doubt that technical teams and executives at the new parent firm Aviso Wealth will be having a long weekend of sorts ensuring that the transition of systems goes smoothly. Determining which online brokerage is best is incredibly challenging at the best of times, however with ultra-competitive pricing, loads of features and ever-improving user experience, the differences between discount brokerages aren’t nearly so clear anymore. This past week, US online brokerages were put under the microscope by Kiplinger, which released their latest US online brokerage rankings for 2018. While TD Ameritrade came out on top, the rankings indicate just how close the top four US online brokerages were to each other, a point which seems to validate the observation about how competitive firms have become. What was very interesting to note, however, is that the bulk of what contributed to the top firms’ scores was not commission pricing. In fact, of all of the categories investigated, commissions and fees was the weakest category among TD Ameritrade, Charles Schwab, Fidelity and E*Trade. Perhaps that bodes well for online brokerages in the looming fee battle. 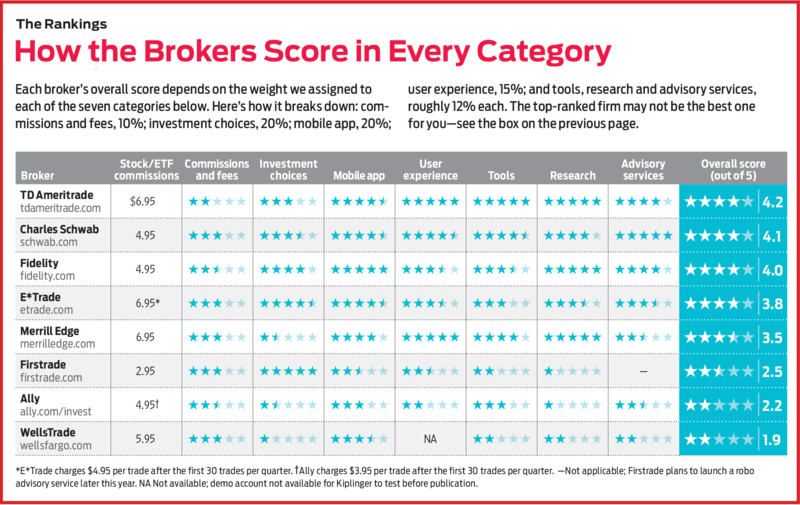 It was also interesting to note how small the field of online brokerages ranked was relative to the possible options out there. The notable absences of Robinhood or Interactive Brokers could have been interesting to stack up against other brokers especially in the user experience (UX) and pricing categories respectively. It might have also highlighted the fact that while pricing and even UX are big draws for firms like Robinhood, features like tools or advisory service are places where well-established online brokers have a leg up. Finally, another interesting tidbit from this article was the mention that lesser-well-known US online brokerage Firsttrade has also dropped their commission fees for trading ETFs and stocks down to zero, a move that comes on the heels of JP Morgan’s announcement last week. As a segue from the move by Firsttrade mentioned above, there is clearly a shift taking place in the online brokerage industry as a result of a massive announcement by JP Morgan launching zero commission trading via their You Invest platform. A recent article in Investment Executive which featured comments made by credit rating agency Moody’s, reiterated what many observers of the online brokerage industry also believe, that the impact of reducing commissions is going to have a material impact on the revenues of some online brokers more than others. Also, not everyone is sold on the value of commission-free trading for DIY investors either as this piece from CNBC highlights. Taking the example of what may transpire in the US, it is not that hard to envision similar concerns for Canadian online brokerages who will be put to the test to see how much lower their commissions and cost structure can go before they tap out of the DIY investing space altogether. 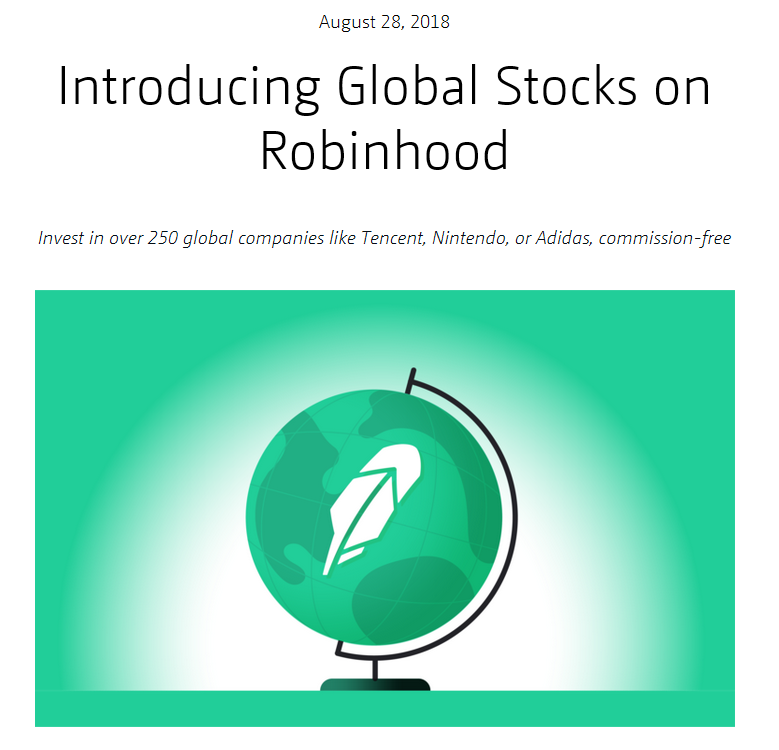 On a side note, Robinhood online brokerage announced this week that they will be offering commission-free trading access to 250 global stocks via trading in American Depository Receipts (ADRs). Select firms such as Nintendo, Adidas, BMW and even Canadian firms will now be available. We will continue to keep a close eye on what’s unfolding in the commission-free trading space. Until this approach to online investing becomes the norm, there’s a good chance it’s going to occupy the spotlight and entice investors to kick the tires on trading commission-free. For a quick catchup, since we reported on the Wealthsimple Trade announcement, we’ve seen the number of folks in the waiting list climb to almost 60 thousand, which for many Canadian online brokerages, represents a lot of existing clients interested in trying out the competition. Stay tuned. Options trading recently got a little easier at CIBC Investor’s Edge. 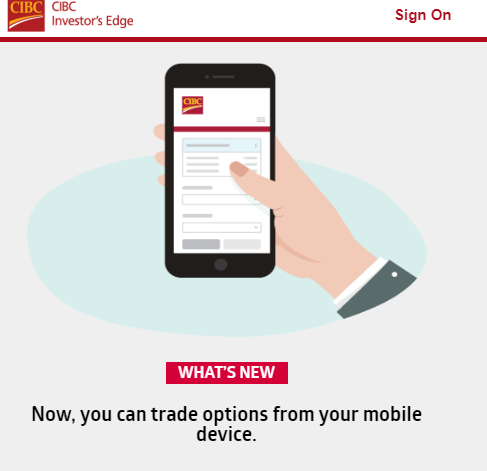 Clients of Investor’s Edge can now trade options via CIBC’s Mobile Wealth app, with the functionality of options trading available on the full site. Pricing for options trading continues to remain the same at $6.95 + $1.25 per option contract at the standard price while active traders (>150 trades per quarter) can expect to pay $4.95 + $1.25 per option contract. Interestingly, we noted that the Globe and Mail’s Rob Carrick reported that there may be a lower standard commission pricing of $5.95 per trade coming this fall as part of a promotional offer. Taken together, the latest moves by CIBC Investor’s Edge are, like many other brokerages, signaling that accessibility to trading platforms and better pricing might offset the costs of staying competitive by enabling trades to be researched and executed more conveniently. Bank owned brokerage or non-bank-owned brokerage – when it comes to DIY investing and putting your hard-earned investment dollars to work somewhere, the question of where still generates heated discussion. In this thread from Canadian Money Forum, the debate over whether to transition out of Questrade and where to go generated a lot of interesting perspective. Leaving money on the table is a perennial curiousity for many investors. One new investor in this reddit thread wondered whether their investment gains could have been better off/could be better off with a lower fee provider. There’s some interesting math as well as a few noteworthy mentions of providers who cater to less active investors. There were a lot of investors closing out the week on a high note (thanks to the spike in activity for cannabis stocks). Now that the long weekend has officially arrived, hopefully there’s a chance to kick back and enjoy the last few days of summer. Whether you’re out picking summer fruits, fantasy football picks or moving over servers and websites for DIY investors, have a safe and enjoyable long weekend!